62 racers, including 10 new members came out to enjoy a beautiful sunny morning exploring the Bottomlands map. Courses were planned by Damian K our own world class orienteer. In addition Damian also is the head coach of our SOGO 3 program who were out in full force. Damian, Bob M and Marion O helped put out controls( we nearly lost one!!!). Karen M, Bob M, and Marion O handled the very busy registration. Finally the young cadets under Coleen's watchful eye, Damian, and Michael K picked up the flags.. Thank you all for coming out, next is Princess Island, and then the middle an sprint championships Hoping the snow stay away for a few more weeks. The start location can be found on the Google maps Widget below. Located at Centre Ave NE and 12 Street NE. Beginner- Stays almost completely in park terrain to avoid any road crossings. Intermediate- Some road crossings. One temporary out of bounds area but should not effect this course. Two artificial fences. Please respect these as they are NOT marked in the terrain but are clearly marked on the map in obvious locations. These artificial fences should be treated as if real (imagine they are actually there in the terrain) as it helps create route choice. See example below. This course has been designed to resemble an Elite course at a World Championships or World Cup. If you are up for a challenge give this course a try! Course distance is measured as the shortest feasible route 4.1km with 20m climb. There are several artificial fences and a few out of bounds areas. Please respect these as they are NOT marked in the terrain but are clearly marked on the map in obvious locations.These artificial fences should be treated as if real (imagine they are actually there in the terrain) as it helps create route choice. See example below. 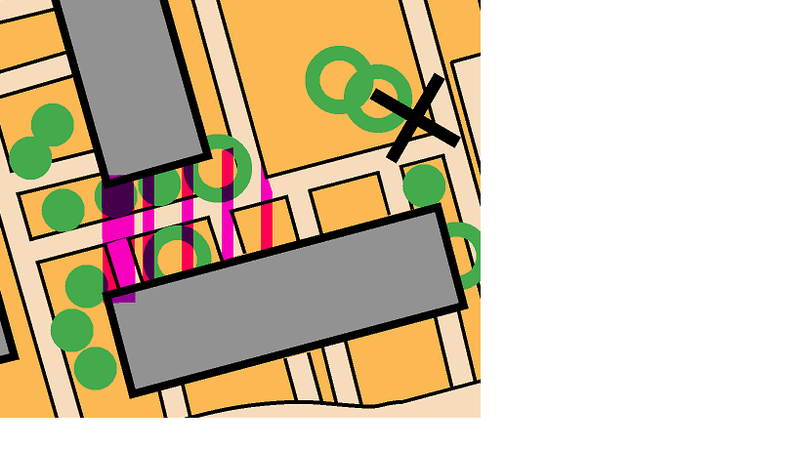 Example of how an artificial fence will be marked on the map. Fall Series consists of 8 events. 5 sprints and 3 forests(Proposed). Middle event for Club championship at the Ranch at Fish Creek. Sprint event for Club championship to be held at SAIT and Riley Park. All participants must be members of the association for 2018. •$20.00/family for the fall series + $5.00/map. 4 events are needed for the series. $40.00 will be charged to these participants up front , which includes 4 races, any additional races would be $5.00 each.